ANY FLUCTUATION in the price and availability of pulses becomes a political hot potato in India for the simple reason that the country is the largest producer and consumer of this key source of protein. But never before had pulses evoked desperate responses from the government. Late night on January 27, Prime Minister Narendra Modi called an emergency meeting of the senior officials of the Union Ministry of Agriculture and Farmers Welfare and the Union Ministry of Consumer Affairs, Food and Public Distribution to curb the rising price of pulses. 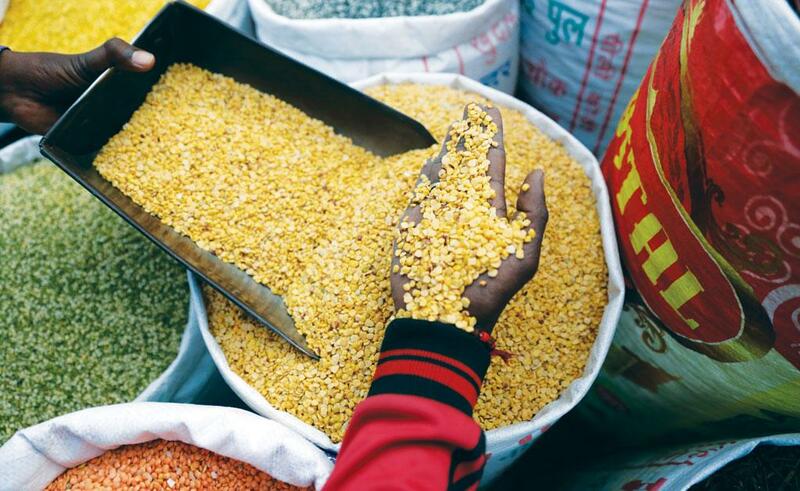 A week earlier, in a bid to tide over the lower production of pulses in last two rain-deficit years, the ministries had announced that they would lift a five-decade ban on a controversial pulse—grass pea or khesari dal (Lathyrus sativus). The sale and storage of khesari dal was banned in 1961 after studies showed it contains a toxin, oxalyldiaminopropionic acid (ODAP), which can cause neurological disorder, neurolathyrism or paralysis in the legs. The government’s move to lift the ban is based on the recommendation of the Indian Council of Medical Research (ICMR), New Delhi, which in 2015 approved three varieties—Ratan, Mahateara and Prateek. “Traditional varieties contain over one per cent of ODAP and can cause neurolathyrism if consumed between 226 g and 330 g daily for over six months. This toxicity level has been reduced to 0.072-0.078 per cent of ODAP in new varieties,” says H C Nanda, senior scientist with the Indira Gandhi Krishi Vishwavidyalay (IGKV), Raipur. IGKV has developed Prateek and Mahateara, while Ratan has been developed by the Indian Agricultural Research Institute (IARI), New Delhi. The Food Safety and Standards Authority of India (FSSAI) will hold a public consultation on the new varieties before the ban is lifted. “India produces 0.43 million tonnes of khesari dal on 0.56 million ha,” says Ashutosh Sarker, coordinator at the International Center for Agricultural Research in the Dry Areas, New Delhi. While most of it is grown in Maharashtra, where the government revoked the ban in 2008, farmers in arid areas of Bihar, Chhattisgarh, eastern Uttar Pradesh and Madhya Pradesh grow the crop for household consumption. Experts estimate that the production of khesari dal could increase by one million tonnes once the ban is lifted. While this can alleviate the shortage of pulses—India imports 4-5 million tonnes of pulses a year—scientists are divided over the government’s move to lift the ban. When the government banned khesari dal in 1961, it had sparked off the first food controversy in India. Toxicity of khesari dal came to notice in the 1950s and 1960s when the country was reeling from frequent droughts. “Khesari dal is a drought-resistant rabi crop that requires one-two rounds of irrigation and has a cropping period of 120 days, compared to other pulses that require around 150 days,” says N P Singh, director of the Indian Institute of Pulses Research, Kanpur. So, farmers grew it on a large scale to tide over the drought period. In fact in 1950-1960, khesari dal was grown on 1.3 million ha. “That was the period when neurolathyrism surfaced among low-income groups who consumed the pulse as a staple for two to three months due to scarcity of rice, wheat and other pulses,” says Sarker. Outbreak of the disease prompted the Union government to ban khesari dal. But scientific community remained divided over the ban as there was little evidence to show that neurolathyrism occurs among all those who consume khesari dal. “I consume the pulse every day and yet I am perfectly healthy,” says S L N Rao, former head of the Biochemistry Department, Osmania University, Hyderabad, who has done extensive research on khesari dal. To clear the confusion, the erstwhile Planning Commission in 2012 asked ICMR to conduct an epidemiological study in khesari dal-growing areas, especially Chhattisgarh where the pulse is widely grown. The seven-member team observed that khesari dal does not cause neurolathyrism if consumed in small quantities. That year, ICMR conducted another experiment on animals. “We fed khesari dal and milk to 60 goats for four months,” says a scientist involved in the project. “Around 30 of them died by the end of the experiment. But postmortem report suggested reasons for the death were different, and not neurolathyrism. There were three goats, which were weak and shaky. Most of the scientists considered their symptoms as probable signs of neurolathyrism,” he adds. Based on the findings, ICMR conducted three brainstorming meetings in Delhi between 2013 and 2014. But there was no consensus among the participating scientists on the toxicity of khesari dal. Since then, several studies have been conducted to ascertain the health impact of indigenous khesari dal varieties, but they have provided conflicting evidence of its toxicity (see ‘Flip-flop on khesari’). So what could be the reason behind the decision to lift the ban in the absence of a scientific consensus? Experts allege the move is politically motivated. Between June 2015 and January 2016, when the price of pulses, particularly tur dal (pigeon pea), soared by 125 per cent, the National Democratic Alliance (NDA) government felt the heat. It suffered a setback in the Bihar election. Now that the NDA is preparing for elections in five states in 2017, including Uttar Pradesh, the government’s move to lift the ban may be to appease voters, especially the lower-income groups, for whom it is the cheapest source of protein. A kg of khesari dal can be bought for Rs 34 in Bihar, whereas tur dal costs Rs 180. “Khesari dal is mostly consumed by those belonging to Scheduled Castes, Scheduled Tribes and Other Backward Classes. Upper caste communities rarely eat it,” says A Amrendra Reddy, agriculture economist at IARI. Reddy says lifting of the ban will come at a huge cost. First, the new varieties are not free from toxins. Second, its lower price and resemblance to the costly tur dal could lead to widespread adulteration. “Already besan (gram flour) and tur dal are being adulterated with khesari dal,” says S K Datta, former deputy director general of ICAR. Third, farmers could inadvertently mix new varieties with traditional ones having high ODAP levels. “And the toxin could enter food chain,” says Bhaskar Goswami of Food and Agriculture Organization-India. “The government’s decision is neither in favour of farmers nor consumers,” says agriculture expert Devinder Sharma. Instead of solely depending on khesari dal for increasing pulse production, Sharma suggests that the government should provide an assured price to farmers to promote cultivation of pulses. This can easily solve the pulse crises within two years, he adds.